this is exactly what i love about fashion. and there are days like today when i just feel all cheerful and want to dress up like minnie mouse after watching cartoons the whole day with Miguel. there are no rules, the are no limitations. this is also exactly the reason why i can´t define my style. i have great respect for people who have truly found and keep up with their style. i just go on with how i am feeling today. so cute! 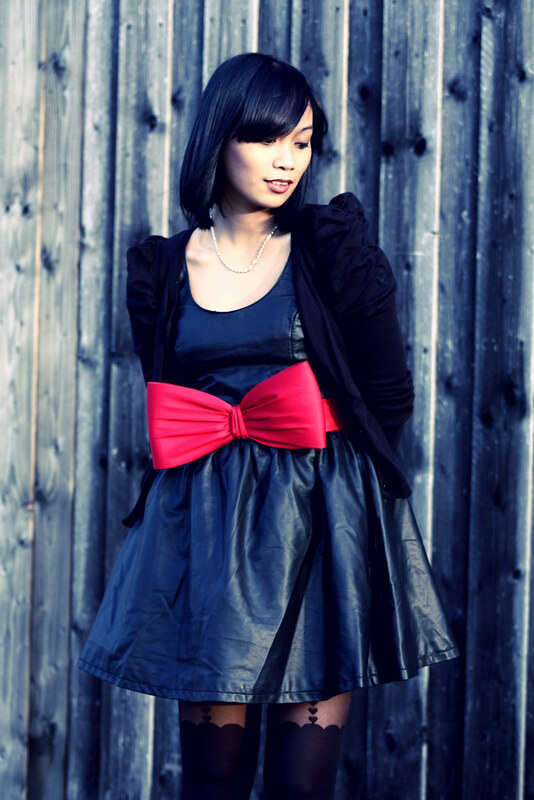 i love the leather dress with the bow! so adorable. you do look like miinnieee! so cute! Das ist doch was Mode ausmacht. Du sprichst mir aus dem Herzen. Aber ich finde, Mode macht doch auch viel mehr Spaß, wenn man sie jeden Tag neu erfinden kann. Is it the H&M dress with the open back and bow at the back? This bow belt is AMAZING! And it's from H&M?! You're outfit looks more expensive that it is, I think! I don’t want to define my style either. It’s more exciting to change and try things out than to stuck in one direction. What you write about that you don't have find your style yet is total true I don't found it yet, and many don't either and I also wear how I feel that day, but thats fun about fashion the adventure. Really a great post, cause I feel you. And that's what I love about you,you remind me on me:-) Dressing up depending on your mood is the best this!Always different,always unexpected! Hun, I are so lovin' that (faux?) leather dress of yours. I'm inspired to make one for myself, since I have no access to H&M all the way here in Hawaii. haha. Hope you're having a wonderful day! Muah. love the belt and the pop of red!! wow, sieht echt klasse aus. aber du kannst wirklich alles tragen! die schuhe sind spitze! A more mature version of Minnie Mouse, but just as lovely. Wow ich liebe es! Tolles Outfit, tolle Bilder! Ich will den Gürtel, der is so süß! Just a perfect look ! I love that dress, moreover shoes and the belt suit you very well ! Oh you look sooo sweet! Love it! 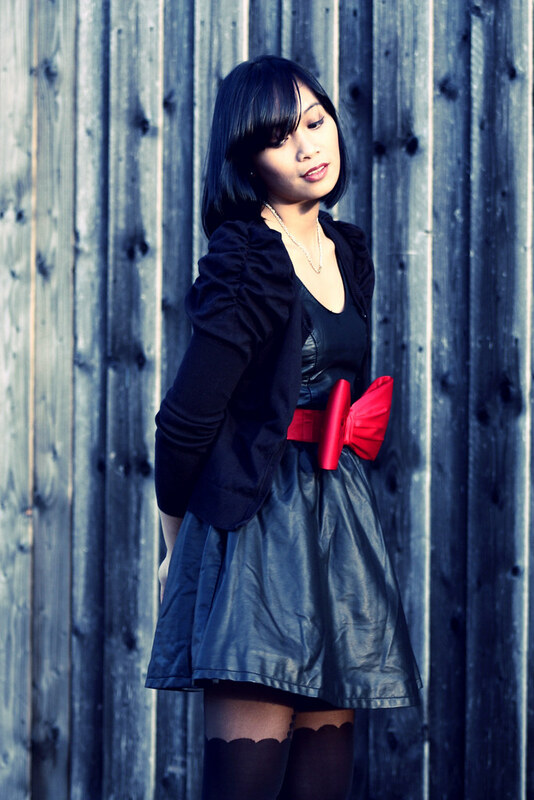 Angelica, you look adorable with the red pumps and that bow-belt!! love this and makes just happy when looking at it! I think i just died a little bit inside. THose shoes, those tights, that BELT, the leather dress, AHHHHH!!! you have so much style. I envy you your good fashion sense and your outfits are amazing! have the same belt and heels... your combination is cute! The tights and the belt are so cute! Ich liebe deine tights! Hot! I hope I can find this dress in HM in France ? Is is the recent collection ? This is the reason I love fashion so much! You can endlessly rediscover yourself.